"Highly metastatic cells leave their happy home and have all these stresses on them. One way that the cell is able to deal with stresses is through disposing of cellular wastes or damaged cell components and recycling them. When we turn off the activity of cellular structures called lysosomes, which a cell uses to do this recycling, the metastatic cells become unable to survive these stresses," says Michael J. Morgan, PhD, assistant research professor at CU Cancer Center and now assistant professor at Northeastern State University in Oklahoma. Morgan worked with bladder cancer expert, Dan Theodorescu, MD, PhD, former director of the CU Cancer Center and now director of the Samuel Oschin Comprehensive Cancer Institute at Cedars-Sinai, and Andrew Thorburn, DPhil, CU Cancer Center investigator, professor and chairman of the CU School of Medicine Department of Pharmacology. Thorburn and Morgan specialize in the study a process called autophagy, which brings cellular wastes to the lysosome, while Theodorescu is a recognized leader in the study of metastasis. The word autophagy is from the Greek for "self-eating." Very basically, in the case of cancer cells, autophagy requires grabbing and then degrading damaged or unneeded structures within the cell to survive situations that would otherwise kill them. First, the thing to be "eaten" is engulfed by a structure called an autophagosome. The autophagosome has two cell walls – an inner and an outer membrane – and between these membranes are dangerous little packets called lysosomes. The lysosomes contain molecules that break things apart. 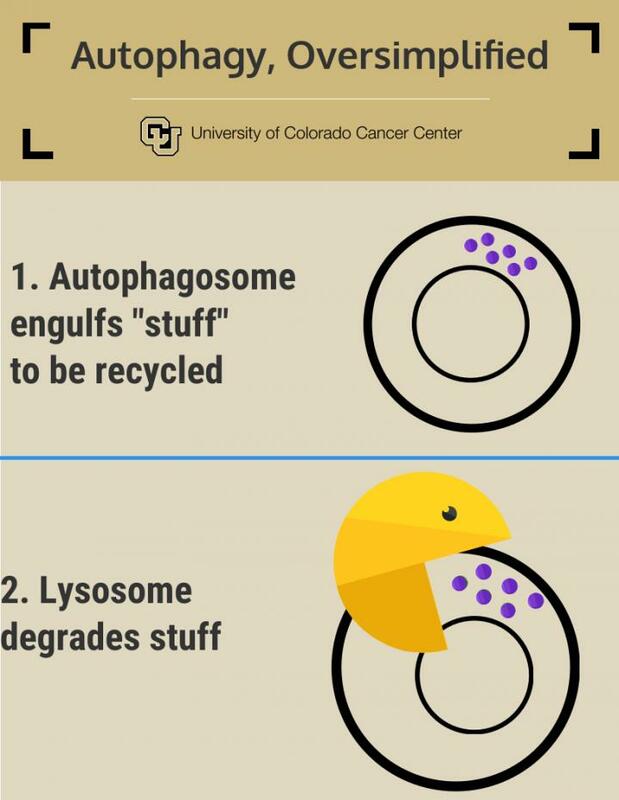 Once inside the autophagosome's outer membrane, lysosomes deliver molecules to break down the thing to be recycled. "What was surprising was that it was not the process of autophagy itself that was specifically important for the metastatic cell," Morgan says. "If you inhibit autophagy at an early stage, you can reduce the cell growth of both metastatic and non-metastatic cells. But if you block the lysosome function of late-stage autophagy, it hits these metastatic cells a lot harder and they actually die," Morgan says. "There was something about lysosomes that was specific to these metastatic cells," Thorburn says. To discover this "something," the group reverse-engineered chloroquine-resistant cells. They did this by growing metastatic cells in the presence of small amounts of chloroquine. Many cells died, but the ones that lived were transplanted and grown with chloroquine again, allowing them to evolve chloroquine resistance over generations. By the time these metastatic cancer cells had evolved to resist chloroquine, they had also lost their metastatic potential. "The door swings both directions," Morgan says. "When we selected for cells that resisted chloroquine, they became non-metastatic. And when we selected for cells that were metastatic, they gained sensitivity to chloroquine. They stopped growing and they died because all of a sudden they came to depend on the lysosomal action that chloroquine takes away." Theodorescu suggests a possible, interesting benefit: "With a patient, if they had a bladder cancer tumor and we gave chloroquine, let's suppose that some cancer cells became resistant to chloroquine. We would predict, based on our study, even if the resistant cells start to grow again, they wouldn't be metastatic anymore," he says. "This may have clinical benefit for the patient." "In future clinical trials that include chloroquine, we may be looking at ID4 to predict which patients will benefit most," Theodorescu says. "This is work similar to what we have done in other settings, namely finding biomarkers that predict prognosis." "We call ID4 a putative biomarker," Thorburn says. "Cells that are metastatic had low ID4. If you made them chloroquine-resistant, they got their ID4 back. When we knocked down ID4, they became more metastatic." Overall, the level of ID4 may show which cancer cells are most metastatic and thus most dependent on the action of lysosomes. And the level of ID4 in a patient's primary tumor may predict how well a patient will respond to treatment with the drug chloroquine, which inhibits lysosomal activity.